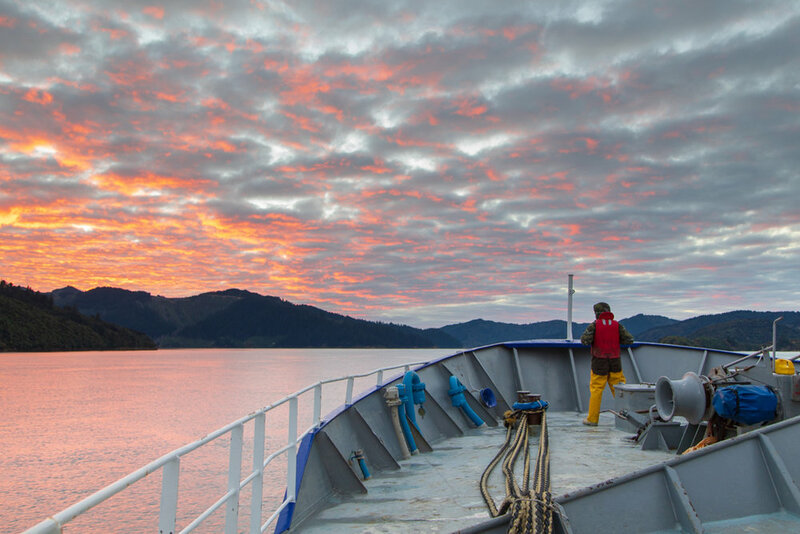 I have a confession for Jim and crew on the Sealord vessel Otakou - it’s an embarrassing secret to admit, but one I must share - I was so seasick out with them last trip I almost cried. This trip started just as the last did - I met the vessel in Picton late Wednesday evening, ready for a predawn Thursday departure. I didn’t get a lot of sleep on ship, but I had my brekkie early, sorted my gear and watched the most beautiful sunrise. I boisterously declared to Jim that this weather would be nothing like the Subantarctic, it would be a walk in the park, but a few hours later I wasn’t eating my words, only because I wasn’t eating at all. I’m not quite sure why I felt so off, but heartbreakingly it really affected my photography. I took less than half the shots of my previous trip, and mucked up a few absolute crackers, but then, you win some, you lose some. Despite being unwell, I loved being out on Otakou again. I felt so at home onboard, some of the guys remembered I’d been out last year, they made sure I was safe, warm and had everything I needed. I was so lucky this time to be able to head down on to the deck (with hard hat and life jacket, tucked well out of the way) to photograph the birds and seals riding the bag all the way to the deck of the boat. I always find it fascinating to see what is coming up in the bag - this time more ling, lots of hoki and still very few other species. The birds were also slightly different this trip, more Buller’s Albatross, no Gibson’s Albatross, and a few wee fairy prions close in to the ship. We were graced with a huge pod of common dolphins which stayed with the vessel for an absolute age, and even the seals seemed to beg for their photograph. The boys worked tirelessly all day, and I antisocially spent my day taking deep breathes of cold Cook Strait air and lying in my cabin wondering why I’d chosen seabirds as a passion (then I remembered bush birds live up hills, and I’d rather be seasick than puffing up a mountain). As the sun set and we hauled in one last bag, I contemplated the day’s events, I had my fingers crossed for some good images for Sealord, and I hoped the boys didn’t think I was intentionally avoiding them all day, maybe next trip I’ll leave my smug remarks about seasickness back at port!